CHAPTER 1: General Conditions of sale over the internet ARTICLE 1 Scope of the sales website These General Conditions of Sale apply without restriction or reservation to all sales made over the web site at www.resorthotel-larocheposay.fr, between the S.A.S LRP Hôtellerie (The Seller), which has capital of 227 737 and its registered office at 4 Cours Pasteur, 86270 La Roche Posay, and which is entered in the Poitiers Business Register number 810 497 545, and its Client. Our sales are subject to these conditions, which shall have the force of law between the parties. These conditions shall take precedence over all general conditions or particular stipulations from the buyer that are not expressly approved in writing by our company. Placing an order automatically implies acceptance of the general conditions of sale. These General Conditions of Sale are available at all times on the web site, and shall, where appropriate, take precedence over any other version or any other contradictory document. The Seller reserves the right to modify these general conditions at any time and without notice, it being understood that those modifications shall not apply to orders previously accepted and confirmed by the Seller. These general conditions shall take effect from 8 December 2014. The products presented on this web site are offered for sale exclusively within the EU. ARTICLE 2 Customer service For information, if you have a query, or for advice, from 9:30 a.m. to 7:30 p.m.: Hôtel Saint Roch 4 Cours Pasteur 86270 La Roche Posay Tel. : 05.49.19.49.00 Fax: 05.49.19.49.40 E-mail: [email protected] ARTICLE 3 Orders Clients must choose their intended purchases on the web site. After a shopping basket has been confirmed, clients must enter their bank details. An order is deemed accepted by the Seller only after payment has been confirmed. The contract is deemed confirmed only after the Seller confirms the order. The Seller stipulates that its sales are only to physical persons of adult age making purchases for their personal needs and who have a physical residential address. Accordingly, Clients commit themselves to having full legal capacity to bind themselves under these general conditions. Clients under the age of 18 are not entitled to use the services offered on this web site. The Seller shall not be liable for the use of this web site by a minor. ARTICLE 4 Rate 4.1 The rates that apply are those in force on the date of placing the order. Any reduction indicated on the reservation page will already have been applied to the price displayed. Our prices include all taxes except the occupancy tax. Unless stated to the contrary, the Seller is liable for postage and packing costs. 4.2.1	Once the order has been paid for in full, the Seller shall draw up a receipt and send it to the Client by e-mail. ARTICLE 5 Data Protection and Freedoms Pursuant to Law No. 78-17 of 6 January 1978, personal details that Clients are asked to provide are required to process their orders, and are for internal use by the Seller. Those details can be accessed and are subject to current legislation and regulations, under which clients have, at all times, the right of access, modification, and deletion, and are entitled to object to such details. ARTICLE 6 Disputes All disputes that may arise from this contract in respect of its validity, interpretation, execution, and termination, as well as the consequences and sequel thereof, shall be submitted to the competent courts under civil law. The competent court shall be the court of the respondents place of domicile. ARTICLE 7 Language of the Contract Applicable Law By express agreement between the parties, this contract is governed by French law. CHAPTER 2: General Conditions of Sale for Leisure Stays PREAMBLE Accommodation capacity: - Room with shower: 1 person - Tradition room: 1 or 2 people - Superior room: 1 or 2 people - Junior Suite: 1 to 4 people The accommodation capacity given must not be exceeded under any circumstances. Clients shall be liable for any instance of over-occupancy. Please inform Reception of any visit of longer than 1 day, i.e. with on-site accommodation. ARTICLE 1 Reservation and Conditions of Payment 1.1	RESERVATION - For all stays of fewer than six nights, in case of cancellation less than 48 hours before arrival, and in case of no-show, your credit card shall be charged with the cost of 1 night per room. - For all stays of six nights or longer, the charge shall be a forfeit deposit of 30% of the cost of the stay. 1.2	DURING THE STAY The bar bill must be settled immediately, or it can be added to the cost of the stay, with the order docket being checked and signed by the resident. 1.3	ON THE EVE OF DEPARTURE Settle the outstanding accommodation bill, the occupancy tax of 0.97 per person per day for residents aged 13 or over, and, where appropriate, telephone calls (0.20 per call), the fee for domestic pets (11 per day), and other charges that may have been incurred during the stay. Payments are only considered final once the amounts owed to the Seller have been paid in. Payment can be made by bank card (Carte Bleue, Visa, MasterCard, and American Express), by cheque, or in cash. ARTICLE 2 Arrival / Departure Keys are available for collection from 3:00 p.m. Any early arrival or departure is subject to prior agreement. In Case of force majeure, an early arrival or departure must be made known to Reception as soon as possible. A late arrival or a shortened stay shall not give entitlement to a refund for unused days. 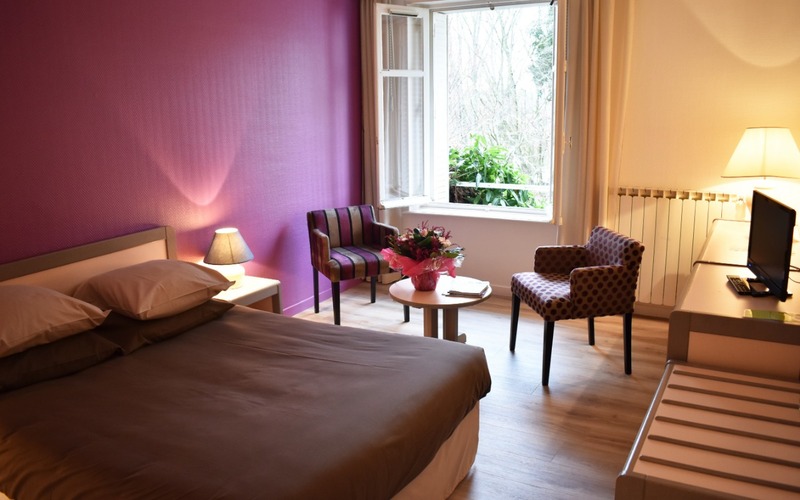 If a client does not indicate late arrival, the Hôtel Saint Roch shall have disposal of that clients accommodation after the second scheduled night of occupancy. Departure must take place before 12:00 midday, with the keys to the accommodation (and to the mini safe, if necessary) being handed in to Reception. Lost keys shall be subject to a charge. Please do not forget anything. If you do, your belongings will be returned to you subject to remote payment or on receipt of a cheque. ARTICLE 3 Cancellation or Deferral Cancellation or deferral must be confirmed in writing. If cancellation or deferral occurs 2 months before the arrival date, the deposit shall be refunded, less an administration fee of 40. If cancellation or deferral occurs less than 2 months before the arrival date, the deposit shall be retained by the Hôtel Saint Roch. A deferred stay is subject to the same conditions as a cancellation; the deposit is not carried forward. In the event of a future stay, you will be asked to pay a fresh deposit. A shortened stay shall not give entitlement to a refund for unused days. You have the option of taking out cancellation insurance for 50 to cover up to 1,000, and for 80 to cover more than 1,000. The insurance policy may refund all or part of your stay (please see the terms and conditions below). ARTICLE 4 General Conditions of Cancellation Insurance 4.1 Events that give entitlement to reimbursement Serious illness: Any alteration in your state of health that is ascertained by a competent medical authority, that leads to a stoppage of all professional and other activity, and that requires monitoring as well as medical supervision. Serious bodily harm: Any temporary or permanent change to your physical integrity that is medically ascertained, that leads to a stoppage of all professional and other activity, and that requires monitoring as well as medical supervision. Hospitalisation: An unscheduled, non-deferrable urgent intervention of more than 24 hours in a hospital setting. The death of the insured person, her / his de jure or de facto spouse or partner, her / his ascendants or descendants, siblings, siblings in law, children in law, and parents in law. Redundancy affecting the insured person or her / his de jure or de facto spouse or partner, if the redundancy procedure is initiated after the stay reservation contract is signed. Serious material damage following a burglary, fire, or water damage occurring at the insured persons domicile or professional premises, and requiring her / him to be present in order to take protective measures. 4.2 Supporting documentation to be provided You are required to prove the truth of the situation that gives entitlement to our services. You must do so by providing all documentation issued by the competent authorities. Based on the opinions of our physicians and experts, we reserve the right to decline your request if the information provided does not demonstrate the facts. 4.3 Insurance cover - The insurance policy covers accommodation, food and drink, and Spa Source services (Balneo-Thermal therapy and Anti-Ageing Unit) provided by La Roche Posay thermal-cure company, with the exception of the thermal-cure cost governed by the agreement signed with health-insurance funds. - Event arising before arrival at the resort: La Roche Posay thermal-cure company undertakes to refund all monies paid by way of advance or deposit at the time of reserving the stay. - Event arising during the stay at the resort: La Roche Posay thermal-cure company undertakes to charge for the services used pro rata to the duration of the interrupted stay. 4.4	Insurance-cover conditions 50 for a stay, a treatment package, or an intervention costing up to 1,000. 80 for a stay, a treatment package, or an intervention costing more than 1,000. The insurance cover only applies if it is taken out and paid for on the date of making a firm reservation for the stay to be covered. ARTICLE 5 At the hotel - For the comfort of all, our rooms are non-smoking areas. You may smoke on the hotel terrace. - Respect for all is essential. In order to maintain a calm environment in your hotel, please do not bang your room door shut; please use the key. Please lower the volume of the television set after 10:00 p.m. ARTICLE 6 Half board Half board is available for stays of 4 consecutive days or longer. It includes breakfast at the Hôtel Saint Roch, and 1 meal per day (lunch or dinner) at the Saint Roch Restaurant. Meal supplements must be paid directly to the restaurant or added to the bill. Meals not taken shall not be carried forward, and they shall not be deducted from the half-board cost. A picnic hamper is available subject to prior request. ARTICLE 7 - Animals Domestic pets (except Category 1 dogs) are accepted at the Hôtel Saint Roch subject to a daily fee of 11 per animal. For reasons of health and safety, and respect for others, the animal must be vaccinated, kept on a leash, clean, and silent. ARTICLE 8 Liability It is recommended that no item of value be left in the accommodation (apart from in the mini safe), or in cars left in the car park. ARTICLE 3 Cancellation or Deferral Cancellation or deferral must be confirmed in writing. If cancellation or deferral occurs 2 months before the arrival date, the deposit shall be refunded, less an administration fee of 40. If cancellation or deferral occurs less than 2 months before the arrival date, the deposit shall be retained by the Hôtel Saint Roch. A deferred stay is subject to the same conditions as a cancellation; the deposit is not carried forward. In the event of a future stay, you will be asked to pay a fresh deposit. A shortened stay shall not give entitlement to a refund for unused days. You have the option of taking out cancellation insurance for 50 to cover up to 1,000, and for 80 to cover more than 1,000. The insurance policy may refund all or part of your stay (please see the terms and conditions below). Best Rate : discount on reservation ! The firm reservation of your stay shall be confirmed by the total amount for the stay being debited. Cette offre comprend une nuit en Chambre Supérieure ou Tradition pour 2 personnes selon les disponibilités. Le tarif tient compte de la réduction. The reservation is not allowed for this period. LE PLUS LOGIS 1 glass of local wine per pers.